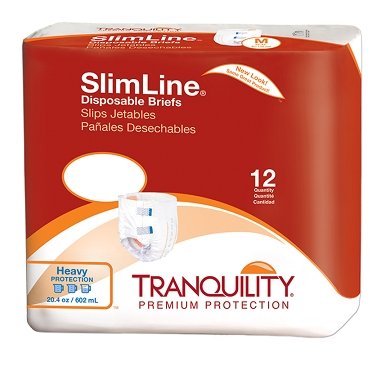 Overview – The Tranquility Slimline Disposable Brief will conform to the body for a comfortable fit while still providing superior absorbency. 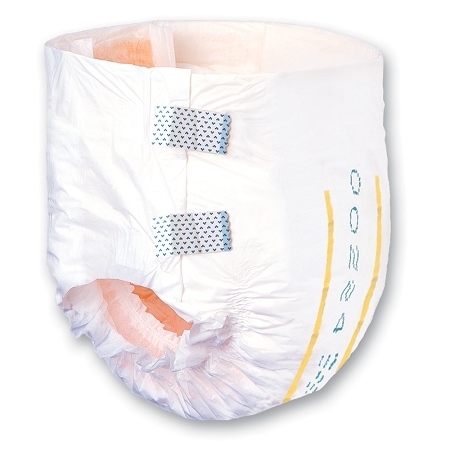 It is an ultra thin adult diaper that offers maximum protection without the bulky feeling. This slim fit design will boost confidence while providing comfort and security from leakage. These are an excellent choice for daytime use. They are designed to fit well under normal clothing. Both soft and comfortable, these briefs have superior absorbency, providing the peace of mind and self confidence necessary to make it through the day. Absorption – Tranquility tests their products by the C.U.P. method. That is the capacity under pressure test. In other words, the fluid is applied with pressure just like your body would. It does not test by the soaking method. This C.U.P. method tests both the capacity and the strength of the products. This method is used to see what absorption is like if the person is sitting, standing, walking or laying down. It is a more complete, honest testing of a product. Their absorption technology is called the “peach mat core”. It is the inner core of the product. It quickly absorbs the fluid, wicks it away from the body and keeps it contained in the center core. This promotes better skin health, odor reduction and urine pH neutralization. There is a wetness indicator that shows when this product needs to be changed, reducing unnecessary changes that result in wasted product. Fit – These briefs also have the Tranquility feature of the dual cuffs. That is a inner cuff that will direct any fluids back to the center core and the outer cuff to contain any leakage. The tabs at the waist and leg openings allow for maximum adjustments. You make the brief fit your body with these adjustments. If you have thinner thighs, the briefs are excellent as you can get the leg openings snug with the tabs. Odor Reduction – This is done with the peach mat core. The core wicks the fluids so quickly that it eliminates any chance of odor. It retains it within the core also eliminating any tell tale odors. Additional Products or Alternatives– Some people still feel the need for extra protection with the cover-ups. You can add extra capacity by adding booster pads. A night time alternative is the ATNs by Tranquility. I am looking for something as good as Tranquility that won't leak at the legs openings. Will this product help? The Tranquility Slimline Brief is perfect. It is a brief with tabs giving you the ability to make the sizing adjustments you need, where you need them. To prevent leakage you need to have a snug fit and you are not getting that with the pull ups. With the tabs you can get a snug, comfortable fit. I want to try this product and only order a package, how much is shipping for just a pack? It's free shipping on all orders in the Continental US, including packs. We will ship to Alaska or Hawaii, but you would be responsible for the actual shipping charges at time of shipment. I use the Tranquility Overnight Pull-ons at night, is the Slimline a good product to use during the day? This is an excellent product for daytime use. It is designed to be discreet with its slim fitting sides. The padding is only where needed. It also has a high capacity. They are easy to change while you are on the go. How do I make sure and get a proper fit with this product? The first step is to take your measurements carefully. You will need your waist measurement at the belly button and your hips at the widest point. The larger of the two is your inch size. Then check the sizing chart to see what size you would need. When trying a product for the first time, always order the lowest unit of measure possible, usually a package. This product has tabs at the leg and waist openings. These tabs will give you the adjustments you might need. Make sure you have a snug, comfortable fit. The brief's fit should be snug not tight but absolutely not loose. Are these really better than the bargain brand I get at the store? You probably can answer this question yourself. Does the product you are using leak? If it does, try these and I believe you will receive your answer. Tranquility has one of the highest capacity set of products on the market. They test their products using the C.U.P. method – capacity under pressure. This method is most like how you release fluids from your body. This method will give you the most accurate measurement of capacity. We try to make delivery to our customers within 48 hours of receipt of order. Orders received over the weekend are processed on Monday. Does this have a cloth-like backing or plastic backing? These have never leaked on me, at night or during the day. I love them. The items run small so I should have purchased the next size up. Not a "Brief" as I expected. The fit was very tight. Had a problem with the tale closure. If you do not follow the instruction, you cannot pull the tape off without ripping the liner. It does take a while to get the fit but to be expected with a new product. I did try it, for the intended purpose, and it worked as advertised. Disappointed, I have a 38" waist and ordered the 32-44 which are too small for me. I should have ordered the next size up. These are great for ordering each month.